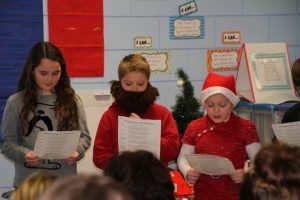 L-S third graders invited parents, family, and friends to a holiday-inspired readers theater on Wednesday, Dec. 21. For the past two weeks, students have been preparing for the readings under the direction of teachers Mrs. Beth Yoder and Mrs. Sabrina Edsen. On Wednesday, Dec. 21, the students projected their voices and read their parts with expression in front of the classroom audience. Max Morvant reads a book to his mom, Robin Morvant, and grandma, Dee Vander Wilt. Students in Mrs. Yoder’s classroom performed three small group readings – “The Grinch Who Stole Christmas,” “The Polar Express,” and “Redheaded Robbie’s Christmas Story.” The entire class performed “A Visit From St. Nicholas” to close out their program. 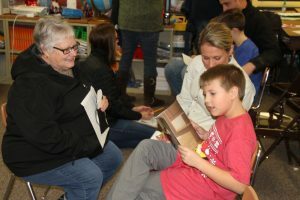 Following the readers’ theatre, Yoder invited everyone to enjoy refreshments with their parents and grandparents. 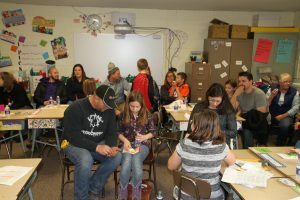 Following their readers’ theater on Dec. 21, Mrs. Yoder’s class enjoyed Christmas cookies with their audience. On the other side of the classroom wall, students in Mrs. Edsen’s and Mrs. Plate’s third-grade class were holding a readers theatre of their own, telling the story of “A Visit From St. Nicholas.” They read several selections, as well as sang holiday songs for their audience before enjoying cookies and sharing books and projects with their visitors.